Everyone is welcome to our workshops irrespective of background or experience. Sarang Cultural Ventures, primarily aims at propagation and exchange of different cultures. In today’s increasingly violent world, an understanding and acceptance of different cultures is the only way to peaceful co-existence. Also, the existence and growth of any art form does not solely depend on the performer. A knowledgeable audience who can appreciate it in full measure is equally important. So we welcome to our events, not only the professional or aspiring artists but also culturally-oriented people seeking to get acquainted with the arts & culture. 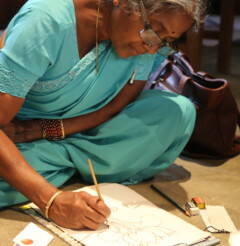 We offer opportunity to understand and study Indian art forms, languages, cuisines and Yoga through workshops.